Last month, a massive dam holding back a lake of waste from an iron ore mine collapsed in rural Brazil. The exact toll from the tsunami of metallic sludge is still unknown. At least 130 are confirmed dead but, as one elderly woman said, “It’s easier to count the living.” Hundreds remain missing. Some bodies will likely never be exhumed from the muck. Surely you heard about the disaster, expressed momentary horror, then went about your daily life as if such matters did not concern you. They do. Like it or not, your hand – all of our hands – helped breach that dam. Those who benefit most from the global economy have equally global moral responsibility. If you’re reading this newspaper in Massachusetts, glance outside your window. See any mines? Count yourself lucky. The largest such chasm in Boston was the Big Hole formerly occupied by Filene’s Basement. Actually, we’re not lucky at all, just rich. Most of us in MetroWest don’t want mining. We prefer other, far safer jobs, never mind backyards unblighted by large-scale resource extraction. And we have the affluence and power to make corporate and government leaders take heed. Not so the poor souls recently entombed in the mud. Most Americans look to nature for rest and relaxation. We sojourn in the forest, like Thoreau, to “learn what it had to teach.” Others sell their woods and hills to survive. It is far better to be on the buying end of consumerism than the giving end of iron ore and other raw materials. Just ask the people of Vila Ferteco, the community downstream from the shattered dam. Or ask anybody at the fringes of the world system. I know some of them well, having lived and studied as an anthropologist in a community along the Sepik River in Papua New Guinea. They have little political voice, less money, and no position of privilege that would cause corporate directors or public officials to take notice. That’s why their society is at risk from one of the largest gold and copper deposits in the Asia-Pacific region, the Frieda River mine, now under development by an Australian company, PanAust, which is a subsidiary of a Chinese government entity. Many people along the Sepik River are speaking out against this mine. Few seem to care or listen, especially shareholders and consumers on the other side of the world who will someday reap the lion’s share of the mine’s benefits. There are few opportunities for a paycheck in the developing world, never mind a job that would pass muster by the workplace safety regulations that protect your own labor. More than 750 million people, mostly in the Global South, have less than a $1.90 a day in their pockets. What they have, however, are the natural resources – minerals, timber, oil, and gas – that are fed to factories in Nigeria, India, and Guangzhou, then shipped as the myriad products that arrive by Amazon on our doorsteps. It’s not so far from Bangladesh or Brumadinho to the local mall. Nobody gives up their land because they find pleasure in open-pit mining. They do so because they have as much choice in the matter as they do clout in the boardroom or parliament. Corporations know this well, and so do as they please in distant places beneath the palm trees, at least those that remain standing after clearcutting for palm oil plantations. The end result is what just happened in Brazil. The Global South is the resource Wal-Mart for the industrialized world, only with worse wages and no health care benefits. The poisonous sludge that murdered a town last week came from a mine owned by a Brazilian company, Vale SA. 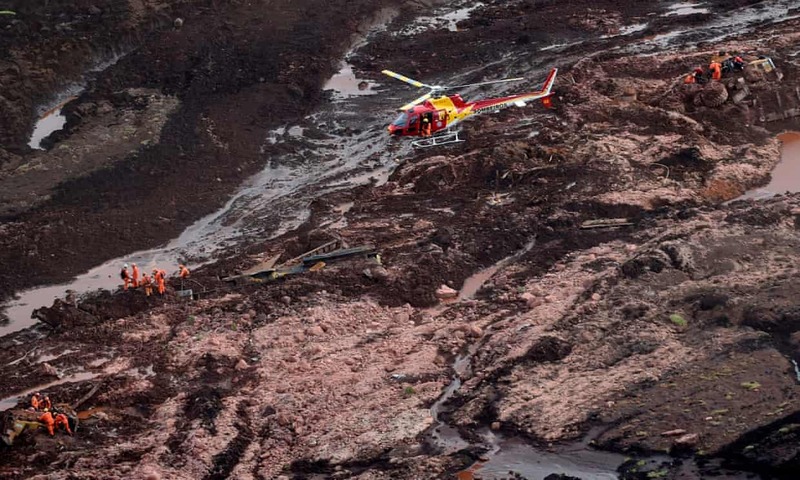 The same firm, together with the Anglo-Australian giant BHP Billiton, owned another Brazilian mine where a collapsed dam killed more than a dozen in 2015. BHP Billiton once operated the Ok Tedi Mine in Papua New Guinea that discharged 90 million tons of waste into the local river system – about 500 square miles – for more than a decade. Half the river, reported The Australian Conservation Foundation, was “almost biologically dead.” The cultural survival of its indigenous communities remains at risk. Across the border in the Indonesian province of Papua, the U.S.-based company Freeport-McMoRan runs the world’s most profitable gold mine. Some of those profits, reported by The New York Times, went into the pockets of military and police officials to ‘secure’ the site. Needless to say, major Western banks and investment firms, such as Vanguard, Blackrock, State Street, Fidelity, Citicorp, Bank of America, and John Hancock, pour assets into these mines, maybe even some of your own retirement funds, just as the mines pour their toxic waste down nearby hills and waterways. There is no shortage of blame. Corrupt politicians. Greedy Wall Street financiers. Multinational corporations and the glossy PR firms they hire to promote ‘global citizenship.’ But most of the blame rests with you and I – everyday people content with our own lives and things, and thus unwilling to consider the human cost of globalization and to demand a more ethical capitalism. It’s time we did. Before another town in a far-flung place most of us can’t find on a map is buried beneath indifference. Eric Silverman, a former Research Professor of Anthropology, lives in Framingham. He is now affiliated with the Women’s Studies Research Center at Brandies University.